I recently picked up a few things for the cabin and thought I would share in my first haul! Faux Fur Oblong Pillow: Is there anything more cabin-esque than a fur pillow? This pillow has the perfect shades of brown for our cabin. Plus it's super soft! 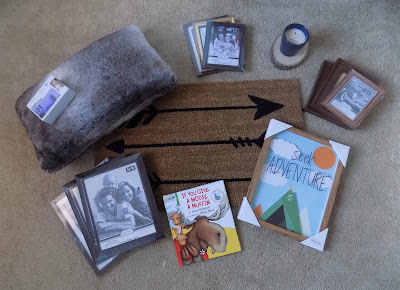 Three 5X7 Dollar Store Frames: I have gathered a stack of pictures from over the years in the hopes that I could create a gallery wall at the cabin. This was the start of the frame collection. Hand Made Modern Wood Round: The perfect addition to any space. Place it under a decorative item or prop it up against a wall and get an instant woodsy feel. Ceramic Jar Candle Seagrass Blue: I wanted to get a candle for the cabin and thought this deep blue ceramic candle with its layered line design was the perfect fit. The design reminds me of a big comfy sweater. Two 4X6 Dark Wood Tone Frames and One Dollar Store 4X6 frame: To add the the collection of frames for the soon to be gallery wall. The two frames from Target were on sale for $2.50 at the time! eyes on this item for awhile and thought it would be the perfect addition to the game shelf in the loft. If You Give A Moose A Muffin Hardcover Book: I love this entire series by Laura Joffe Numeroff. Any book about a moose belongs at the cabin. He'll fit right in with our vintage Bernstein Bear books. 18 X 30 Arrow Doormat: The cabin was in desperate need of a new doormat. I saw this one and thought the arrows were a nice touch for the cabin. Artificial Three Leaf Plant: I am not sure how this guy slipped through the cracks but he did not make it into the picture. I love the look of plants when decorating. We don't get to make it to the cabin as often as we would like so an artificial plant is the way to go. I think it would look particularly good placed on top of the wood round. It was so fun to gather all of these items up for the cabin and pick a spot out in my mind of where to put them. Plus who doesn't love a good shopping spree? I can't wait to do another haul. What are your favorite types of hauls?